Around 63 countries, some with dozens of islands and many places more than once. How does one even begin to review such an amazing experience where almost every day of our journey brought new experiences, friends and insights into how other peoples live. Choosing the images alone proved a tour de force, selecting from 13,653 photographs of places, 1182 of people and 5,710 of nature of which 3663 were underwater marine scenes. What has emerged is an insight into the experiences of two nomads leisurely adrift on the oceans of the globe. If you care to dig deeper, we recommend you delve into the 36 earlier Updates covering our progress around the world. People have often asked which was the best bit of the trip. Furnishing an answer has always proved difficult as everywhere has something of interest and there was never a single place that we regretted visiting. That said, the magic for us really began when Amoenitas emerged from the Panama Canal on the afternoon of February 5th 2002. From there on to New Zealand is 8,000nm of beautiful tropical islands populated by friendly, welcoming Polynesian peoples. Gone are all the security concerns of the Caribbean Islands and South American coast. Added to which the winds for sailing are often ideal, the climate is warm with crystal clear waters stocked with amazing quantities of fish. Above all, the pressure from numbers of people both afloat and ashore is orders of magnitude less than we found elsewhere. Sailing friends often remark that from the South Pacific onwards the enjoyment from cruising gets monotonically worse. SE Asia is pretty good but after that, the Mediterranean is usually a great disappointment. OK for old rocks and history but overcrowded, expensive and competitive. Our overwhelming impression was of an overcrowded planet, such that wherever you roam from remote Easter Island of the South Pacific to the high plains of the Tibetan plateau, man has proliferated to the point where he has reached the limit of what resources the local environment can support. To scientists like ourselves, we guess that this is only what is to be expected but it dealt many a blow to our hopes of finding truly remote, undeveloped places. All too often it led to episodes like our first visit to a very basic store on a minute French Polynesian island where we found little food to buy but shelves stacked with Pringles. Take our advice, if you aspire to seeing the world, forget the Navy and get a job as a salesman of junk food snacks. However, before we begin the review of our epic voyage with some of our favourite places, we should really say a few words about our last season afloat (2014) when we took Amoenitas from southern Sicily to the south coast of France. We left Ragusa Marina on 10th May, calling at Porto Palo on the way to Syracuse where younger son Paul and family joined us for half-term. After a week with us, we moved north to Catania where older son Bruce came to join us with his tribe. Then to Taormina where we had a car and villa available to support the final week of our family bash. After they all returned home we began the final leg of our voyage by transiting the narrow Mesina channel separating Sicily from the Italian mainland. North from there the coastline becomes hostile with high cliffs and few anchorages other than some well separated, shallow harbours. 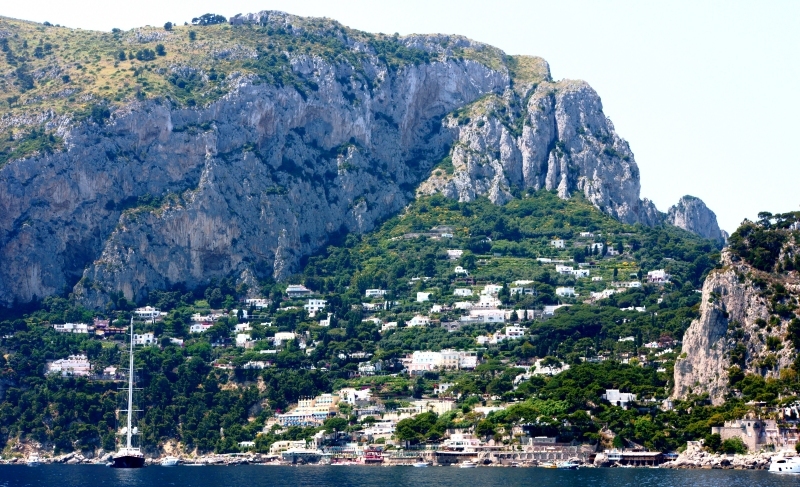 Close to Naples we headed seaward for the island of Capri which proved to be crowded and generally a bit of a disappointment. Ponza, our next stop was much more welcoming with a plethora of stores and restaurants lining it's busy harbour. We passed a very pleasant six days there awaiting a weather slot for the next leg of 182nm that took us through the narrow channel between Sardinia and Corsica. Weather slots bringing more favourable winds often mean a change for the worse, as was the case here. We departed the anchorage in Ponza along with every other boat as the rain and strong winds set-in. Never mind, we could at least sail our course at good speed. 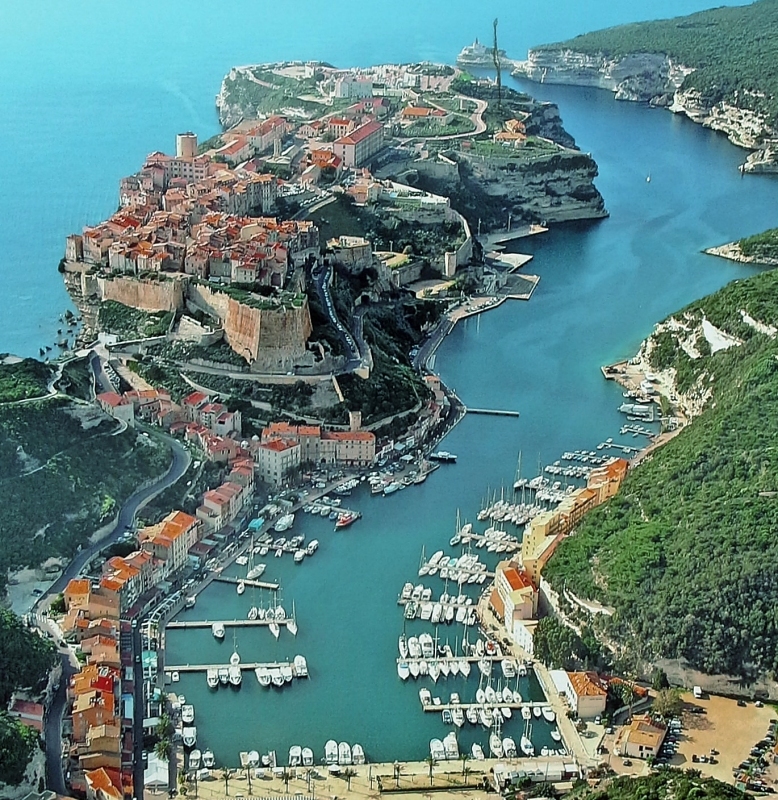 Around 32hrs and several thunder storms later we were passing through the narrow Bonifacio channel in a full gale, heading for the town of the same name on the SE corner of Corsica. As you can see, there can be few harbours that offer such protection from inclement conditions. After a couple of weeks of exploring the east coast of the island we were all set for our very last sail in Amoenitas on the 208nm leg to the marina at Port Napoleon just west of Marsailles where we planned to end this 15 year long phase of our lives. After she was hauled out we had a very intense three weeks of sprucing her up ready to sell and disposing of all our worldly goods she carried aboard. Somehow we managed it but goodness knows how? It is quite amazing how much stuff you can squirrel away in the bowels of a boat. With help from friends we made in the marina there, we managed to get all our personal effects back to the UK. In November Dave went back to Amoenitas to return some cushions and do some tiding. Whilst there an offer was made on the boat, survey done and all sorted, so after three weeks away all was resolved and we were boatless for the first time in 42 years. Now to some of our favourites, beginning with the best anchorage. In June'03 we were lucky enough to acquire a written invitation from a landowner to visit one of the most atractive parts of the Lau Group, well to the east of Fiji's main islands. This is kept as the preserve of the native Fijian culture where other races and especially foreigners are forbidden to tread. Our three months in the area were a magic time, all the better for the relationship we generated with the inhabitants who had seen very few visitors (King Dave & Lady Di). 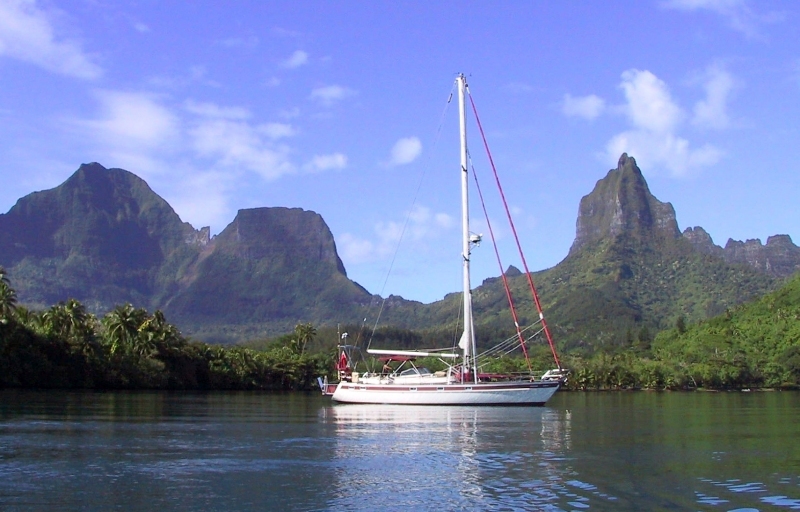 Opunoho Bay on the island of Morea just 25nm from Tahiti is another magic place, not for the anchorage but its backcloth of incredible peaks. This was the view that inspired the musical South Pacific many years ago but not the location which owes much to Bora Bora 166nm further west. 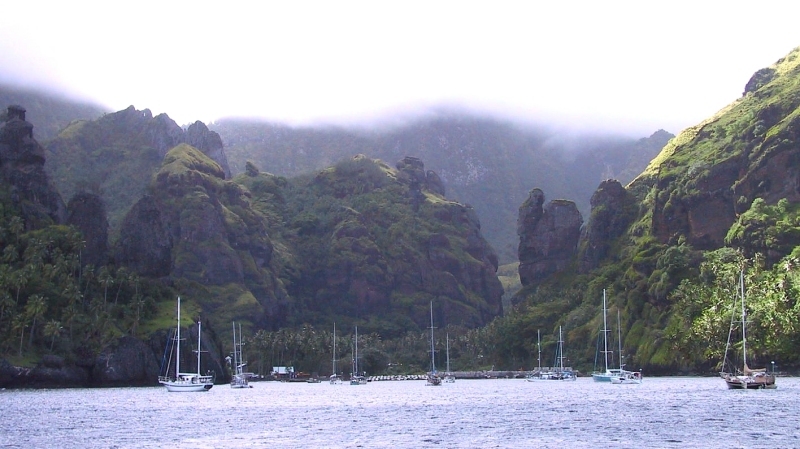 Without any doubt our most inspiring landfall was Fatu Hiva in the Marquesas Islands, a mere 2,938nm and 18 day passage from the Galapogas. This is the longest passage that most circumnavigators would normally make. Not only is it a stunningly beautiful place but it brings forth so much emotion to awake next morning to the sight of green hillsides through the hatch after being so long out of sight of land. Resorts are places that cruisers usually shy away from but there are some exceptions. Prime amongst these is Musket Cove on a small island around 28nm southwest of Lautoka, Fiji. The outfit is owned by an ex-cruiser who has set-up facilities including a bar and BBQ site. The bar is known as the 'One Dollar Bar' but even when we were there it was a missnoma as inflation had raised prices but not the name to the 'two dollar bar'. Though we were not keen on marinas preferring to anchor in remote places where ever possible, there has to be a favourite. No contest again, as the one sited in a natural pool within the small island of Reback, just off the larger island of Langkawi was a wonderfully secure place with a superb community spirit. Having said it was secure, there were problems from the tidal surge after the 2004 Indian Ocean Tsunami when the pontoons floated off the top of the piles. The Google Earth image below shows the marina after it was cleared for repair after that tragedy. We were based there for four years in the SW Monsoon season whilst we awaited the pirate activity in the Horn of Africa off Somalia to subside (it just got worse!). 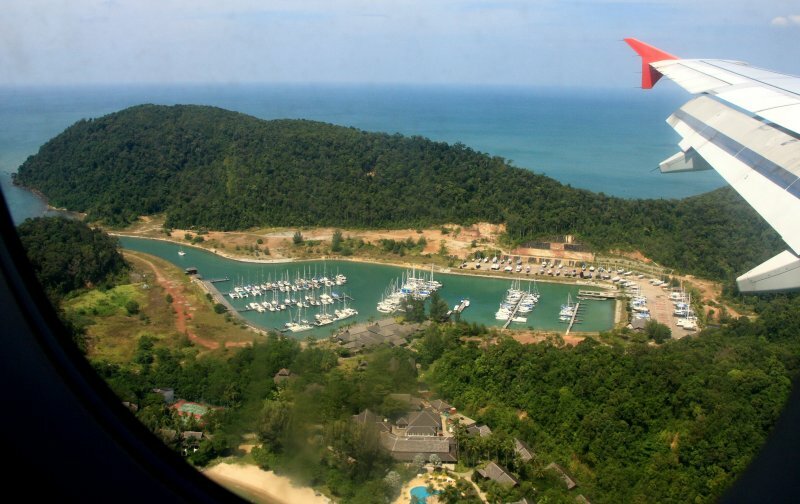 The good news was that it was a great base to travel around Asia from with Kuala Lumpar airport just an hour away from Langkawi by air. Whilst there we explored Thailand, Myanmar (Burma), Laos, Vietnam, Cambodia, China, Tibet, Nepal and India. Magic times! 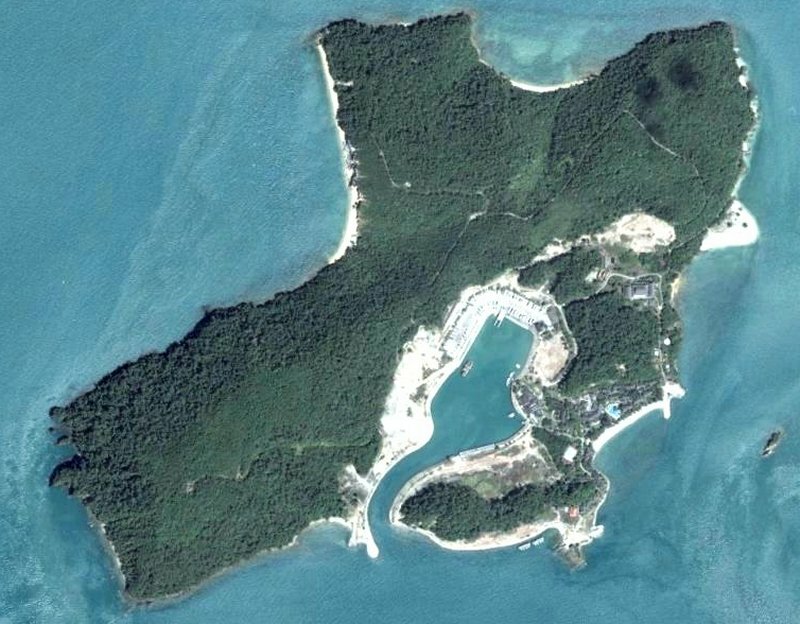 Aside from the Marina, Rebak island had a 4Star hotel and no local population at all. Cruisers could use the hotel facilities where they could afford them but crucially the swimming pool was open to all. In a climate where temperatures were often in excess of 34°C and humidities in excess of 90%, the pool became the afternoon gathering place at around 4pm. During our fifteen years away we ate in thousands of restaurants, from the expensive sublime to the most miserable tin shacks in the back of beyond (eg villages on the Tibetan plateau). Our favourite without any doubt was Pee's beach site at Panwa Bali, just across the bay from Au Chalong in Phuket, Thailand. In our opinion, Thai cuisine is without equal to the point that it is almost impossible to find a disappointing meal anywhere in the country. Pee's place (pity about his name) had the advantage that one could anchor just offshore, going into eat by tender, canoe or even swimming. He even kept an old Suzuki jeep that cruisers could hire to provision in town. That ended when Russian tourists arrived around 2010, hiring the jeep and leaving it a wreck, off-road. They spoilt everywhere they stayed, mainly through excess alcohol consumption. Back to our voyaging, the first big adventure was the 24 day Atlantic crossing from Santa Cruz de Tenerife to Rodney Bay, St Lucia in the Caribbean. This was initially a very slow windless trip as we were just behind a late, November hurricane named Lenny. Fishing on the passage was very successful with wahoo and dolphin fish such as this on the menu frequently. Possibly too often as Dave had his fishing permit revoked. Life afloat was not without elements of shore life such as washday, even in mid-Atlantic. This image also shows the limitations of pre-digital photography when wet film was difficult to get processed reliably in less developed countries, not to mention the latency, often of many weeks. This example like all our efforts was produced by scanning an already sub-standard print. Stepping forward to a review of highlights of the trip we go to Australia, not the nearest destination but first in the alphabet of our computer filed images. Back in the early 70's we had lived in the USA for a while when Dave was seconded to work on a tri-service, four-nation, communication project. There we established a close friendship with the Hamilton family so couldn't wait to travel down to Sydney to see them. Staggeringly, it was as if the intervening 38yrs since we had last been together had never existed. Further, Ted had taken up sailing on his return to Oz and now chaired the Appeals Committee of the Middle Harbour Yacht Club at the heart of Sydney's waterscape where we were regally welcomed. 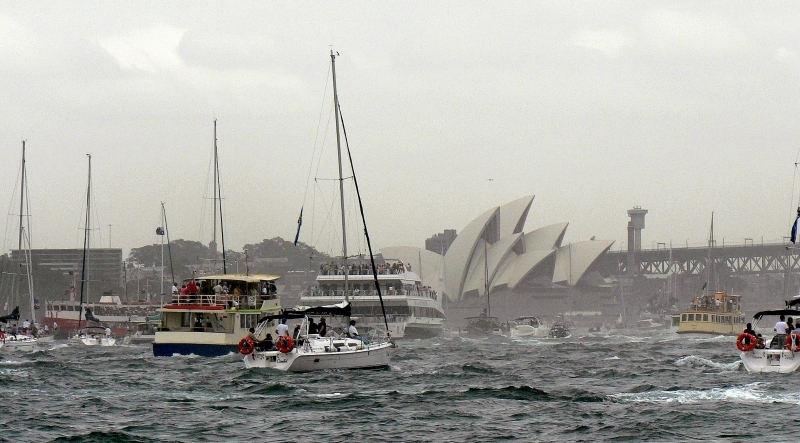 On our second day in the city, Dave was elevated to skipper a 42ft racing, sailing boat with eight guests into the chaos of the harbour celebrations of Australia Day (26th Jan), a daunting experience. As in New Zealand earlier, we bought a car as soon as we arrived by sea, to travel as widely as we could. 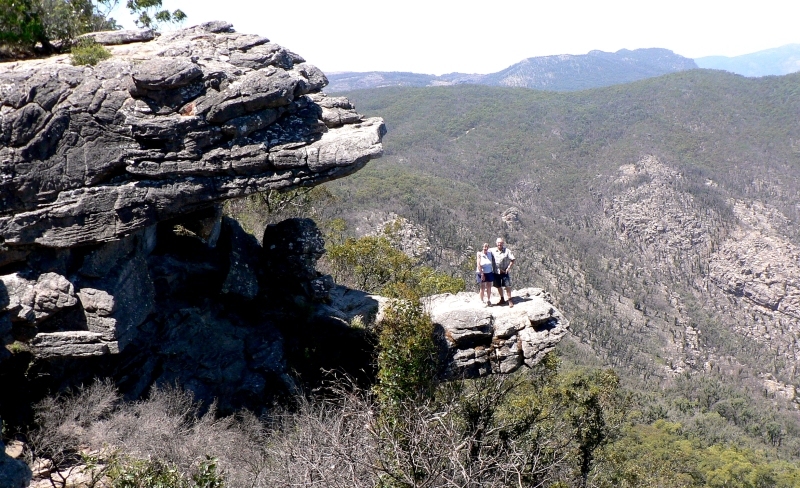 The rock formation below in the Grampian National Park was seen on a trip to Victoria, Tasmania and South Australia. Known as the Reed Lookout, it's existence was down played, if not concealed by the Park Authorities as the drop from where we stood is a sheer 300m! It took more than official discouragement to keep us away but having found it and realised its photogenic potential, there remained the problem as to how we could realise the picture as the time to get from tripod to where we stood was well in excess of the 10 second shutter delay. After some time searching the paths we found two Dutch tourists who very reluctantly agreed to stand in the chosen location and depress the shutter. They survived and we got a splendid image. In Tasmania, off the SE of the continent we explored and camped around the whole island for several weeks. The high spot literally was Cradle Mountain which in an experienced mountaineer like Dave raises high passion as it looks such an iconic peak. On a day Di decided she needed a break, Dave set off alone and against her express orders took off for the summit. It is a challenging ascent as unlike most peaks the technical difficulty increases monotonically as one approaches the top such that within 100m of your goal is a pitch of around 50m of technical challenging rock face. One's memory of the second half of the ascent is of climbers on their way down having been defeated so close to their goal. This is the view from the top, worth all the risks and effort to achieve it. You can see the difficult nature of the terrain strewn with endless big rocks that have to be clambered over. The Park Authority are reputed to keep a helicopter stationed nearby as there are broken limb incidents on an almost daily basis. We entered Australia at Bundaberg in Queensland after a 1041nm passage from Luganville in Vanuatu. One of our best ever trips of 6 days and 11hrs at an average speed of 6.7kts, zero use of the engine and a best daily, noon to noon run of 186nm. That really is sailing! 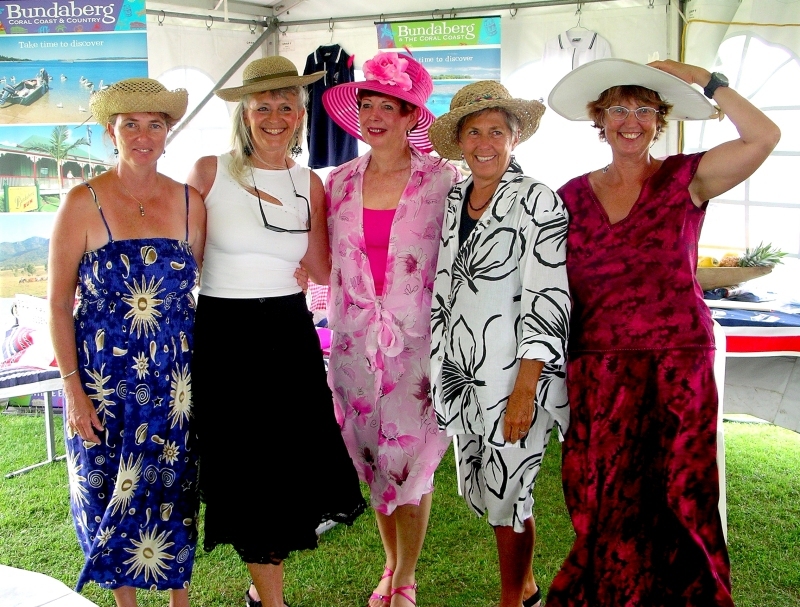 We arrived in time to take part in the marina's celebrations of Australia's premier horse racing event, the Melbourne Cup. Hence the bevy of two cruising beauties on either side of Bundaberg's lady mayor. 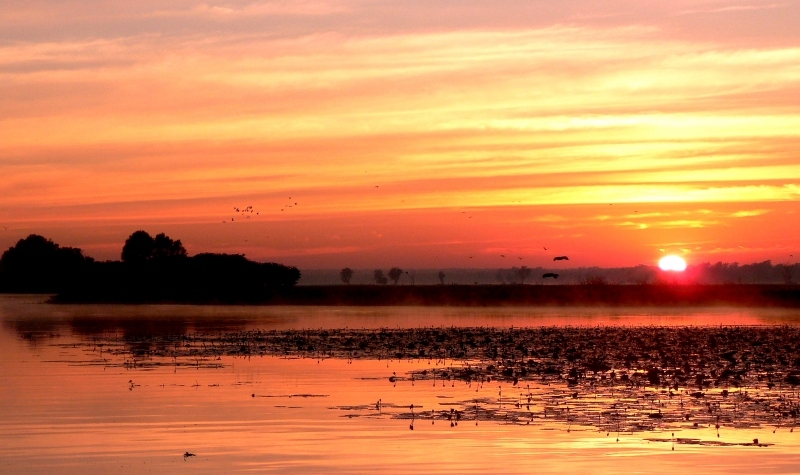 Below is the break of dawn on the Yellow River in Kakadu, in the inspiring hinterland south of Darwin in the extreme north of the Northern Territory which being tropical and subject to monsoon rains, is known locally as 'The Wet'. Sadly, this is as far as we go at present in the summary of our 1yr epic voyage. There is masses more to come which will be added in the ensuing weeks, just as soon as we get control of our two acre garden after 14yrs of neglect under eight tenancies.